Happy Monday and welcome to my newest post category featuring my food purchases from the local Market. I go to this market every Monday. It is 5 min from my house and the their farm is 10 min from my house. Harvest Valley Farms has fresh, delicious real food and it makes me real happy to live so close. I am encouraging you to go to your own local market and shop weekly for what you need. When you shop at massive sized big box stores you tend to stock up as if the world may end on foods that can withstand a bomb. Trust me, take your chances and just get what you need as you need it. I stock up on some essentials but mostly I go to Aldi’s or Giant Eagle two times per month and my market every Monday. At my market if you bring one of their reusable bags you receive 10% off of your order. I love eating and I love saving money so I go on Mondays! I love food shopping and often wish I could go with my friends, family and clients to share my knowledge of what I have learned over the past 4 years on what to buy and what to stay away from. If you know me then you know I am real and I want my sweets/treats too but I truly do love eating healthy real food. My hope with these weekly posts is that a little bit of me will go with you to the market or grocery store and help you make better/smarter food choices! BECAUSE YOU SHOULD ALWAYS THINK BEFORE YOU PICK-No mindless shopping!! & Crumble topping-to make berry cobblers in ramekins this weekend! 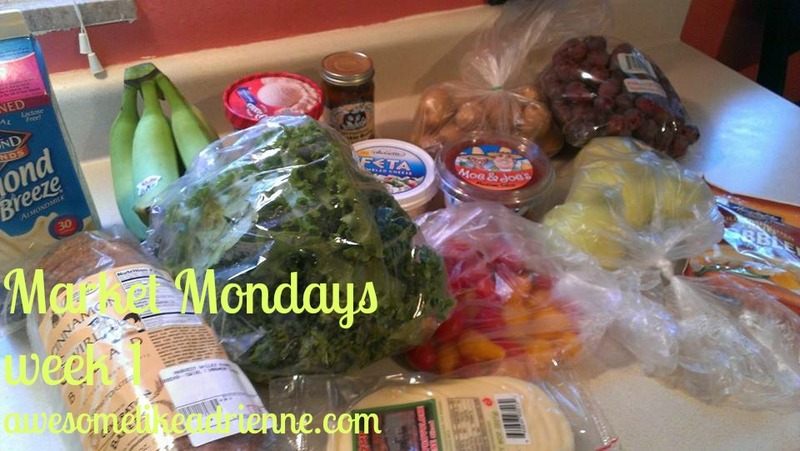 Posted on September 8, 2014 September 8, 2014 by awesomelikeadriennePosted in Market MondaysTagged grocery shopping, Market, meal ideas, meal prep, real food. Love these smart shopping tips. Wish I knew all this many years ago, but it’s never too late to start. Thank you for sharing. Can’t wait to read your next entry.